Featherbed Queen size featherbed (160x200cm). Before ordering your mattress topper, remember to check the size of your mattress: the dimensions must be the same. A 160x200cm mattress will have to accommodate a 160x200cm mattress topper. To secure your mattress topper properly, our synthetic mattress toppers are provided with elastics that serve as hangers. They are useless for natural down mattress toppers that do not move because of their greater weight. 6cm thick, the natural mattress toppers offer an unparalleled level of comfort. Remember to check the size of your fitted sheet to be sure it includes the thickness of the mattress and mattress topper. 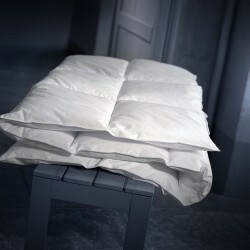 The 160x200cm mattress topper is a welcome addition to a firm or medium mattress, with absolute softness. It is the ideal companion of a mattress of good maintenance. 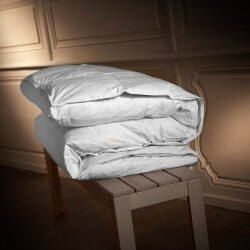 All those who have tested our mattress topper in a luxury hotel remember an incomparable bedding! Make good use of your mattress topper: it is not intended to revive your mattress... On request, we are able to make a custom mattress topper within a maximum of 10 days. Our tailor-made products are neither returned nor exchanged. The natural comfort model is not washable in a traditional machine or in the dryer. 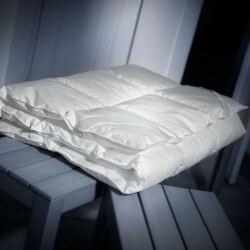 Be sure to protect it like a mattress, with the appropriate protective cover that we offer. This is of course washable, to ensure good hygiene of your mattress topper. Use your usual knit protection to provide lasting protection for your mattress and mattress topper.